The APx500 application software uses versioning, so that multiple versions of the software can be installed on your PC at the same time without conflicts. Therefore, when upgrading APx500, there is no need to uninstall previous version. However, if you have developed applications in VB.NET or C# that use the APx500 API, and you want to use them with a newer version of APx, you will need to reconfigure them to reference the correct version of the API. 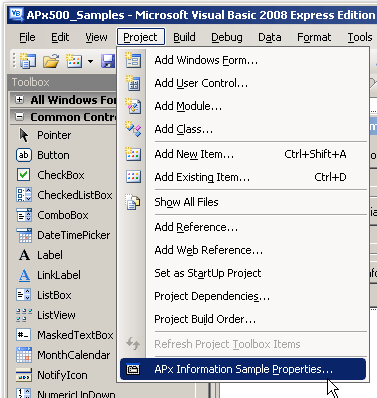 In VB.NET, the references are accessed by selecting Project > Properties, as shown in Figure 1 (Note: The images shown below are from Microsoft Visual Basic 2008 Express Edition. The steps are virtually identical for Microsoft Visual Studio). 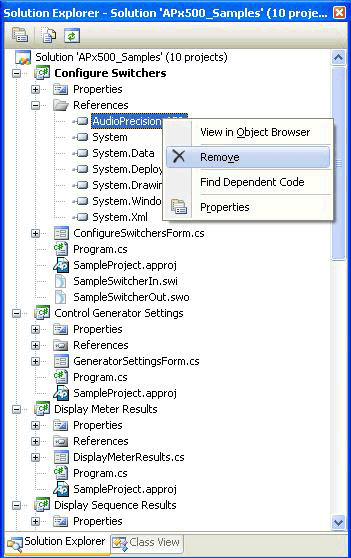 Figure 1 Accessing project properties. In this example, the VB project named APx Information Sample was developed with APx500 v2.3, and we want to upgrade it to use v2.4. First, you need to remove the existing reference. To do so, click on AudioPrecision.API in the References section (Figure 2) and then click the Remove button. 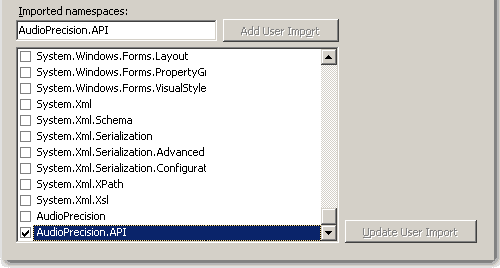 Figure 2 Project properties references and Imported namespaces. Once the old reference has been removed, click the Add… button to add a reference to v2.4 of the APx API. This will bring up the Add Reference window (Figure 3). Select the version of the API that you want to use (in this case AudioPrecision.API 2.4.0.0) and then click OK. Figure 3 Adding a new reference. To complete the process, make sure that the checkbox next to AudioPrecision.API in the Imported namespaces section is checked (Figure 4). The project is now ready to work with APx500 v2.4. 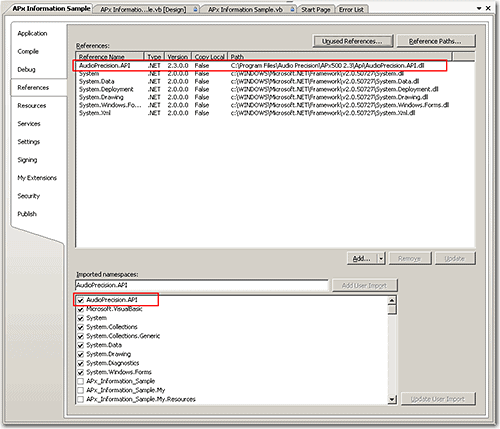 Figure 4 AudioPrecision.API checked in Imported namespaces. In C#, the process is similar. 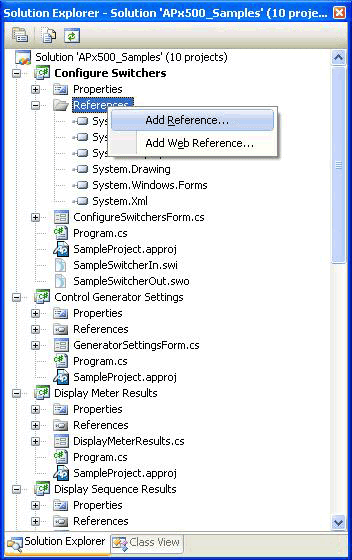 First, expand the References tree in the Solution Explorer. 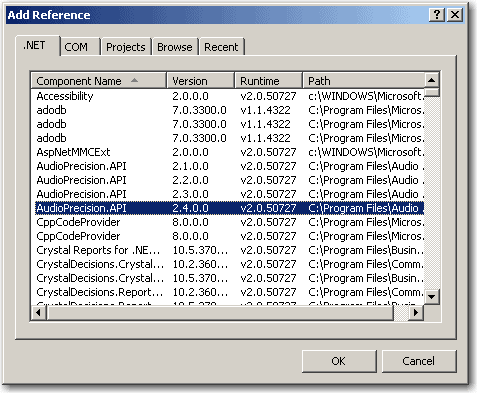 Then right-click on the AudioPrecision.API reference and select Remove to remove the reference to the old version of the API (Figure 5). Figure 5 Removing the old reference in C#. Next, right-click on References and select Add Reference (Figure 6). This will bring up the Add Reference window (similar to Figure 3 above). Select the version of the API that you want to use in the project (in this case AudioPrecision.API 2.4.0.0) and then click OK. The project is now ready to work with APx500 v2.4. Figure 6 Adding a new reference in C#.